Posh boss Grant McCann (right) and his assistant Lee Glover have a plan in place for the January transfer window. Like most lower league managers, McCann faces an anxious few weeks until the transfer deadline of January 31. Posh skipper Chris Forrester is bound to be a January transfer window target. Last season Posh form collapsed after the £2.5 million transfer of in-form striker Conor Washington to QPR 12 months ago. 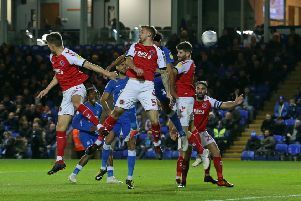 But McCann is relaxed about transfer speculation surrounding captain Chris Forrester, teenage midfielder Leo Da Silva Lopes and goal-assist king Marcus Maddison. He revealed the club have contingency plans should one of his players be whisked away to the Premier League or the Championship. McCann said: “The club policy has always been the same and I support it. Posh collapsed last season following the January sale of Conor Washington. “We would never stand in the way of a player wanting to progress, as long as any deal benefits the football club. “Obviously I don’t want to lose anyone. I have a very good squad now and, like every manager, I’d be happy to keep it together. “Of course I can’t stop people speculating, but we have our own targets should we lose anyone. “But it’s not something me or the players can worry about and I’m confident everyone will stay focused on the job in hand, which is winning promotion back to the Championship. “We have 22 massive matches to go. That’s what I’m concentrating on and that’s what the players will be concentrating on. “I have a terrific group of players. Their attitude has been first class. Posh are still keen to reduce the first-team squad numbers. Striker Shaquile Coulthirst and midfielder Adil Nabi have been made available for transfer.